Everyone is invited to attend the McDowell Honey Bees’ highly popular, entertaining, and educational Bee School–it is free and open to the public! Our annual Bee School fills to capacity every year, so be sure and sign up early. In addition to guest speakers covering major topics of interest each day, there will also be honey tasting, a honey extraction demo, door prizes and lots more! 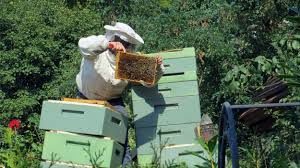 The course is open to anyone of any age interested in learning the basics of beekeeping, no experience needed. Information will be provided on how you and your family can contribute to the process and become a hobbyist beekeeper. There will be an opportunity to take the NC State Beekeepers Certification exam at the end of the course. A field day will be scheduled and the dates will be communicated on the first day of class. To attend, you must register online. Registration is open and is first come, first serve. The course will be taught at McDowell Technical Community College. An optional textbook will be available at the course for a nominal cost. For questions, email ed@sweetbetsyfarm.com or call 828-724-4444.